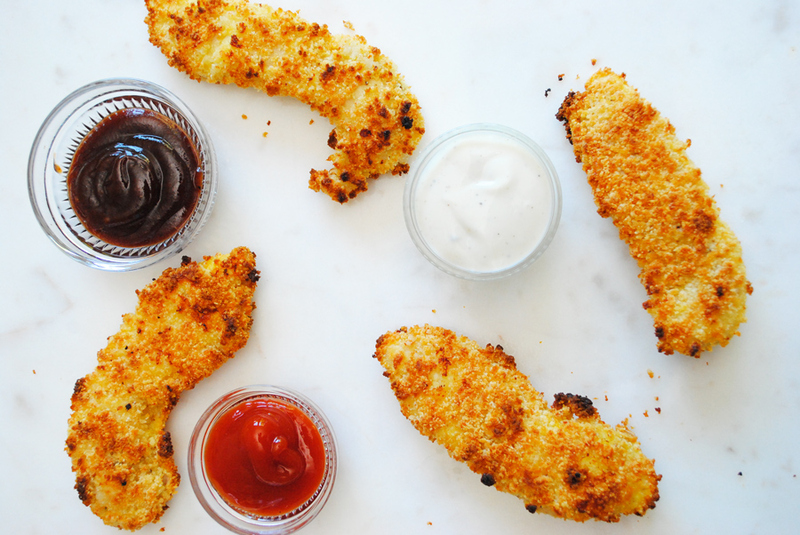 Almond and Panko Baked Chicken Tenders are for kids and adults alike. I created them after having my oldest son scoff and just about any chicken tender placed before him that was not in the shape of a dinosaur. I tried high quality chicken tenders from reputable sources, and he just would not budge. So I thought maybe if he helped me to make them, he would try some homemade ones with good quality chicken and ingredients I could verify were healthy (and could pronounce). This post contains affiliate links for products I use and love and highly recommend. It was a success! He loved them, and we both had fun making them together. Normally my youngest, Will, is the one in the kitchen, but this time Jack was willing to help out. 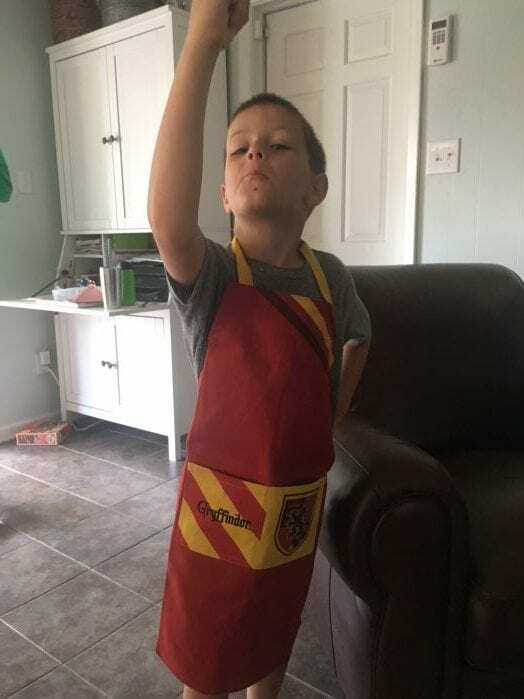 His fancy new Gryffindor apron from Williams Sonoma probably helped coax him into the kitchen with me. The almond flour I used with the Panko was simply because I love the flavor, there is no dietary reason. Panko is often times too large of a crumb for something like this, so I wanted to use a finer flour but not all purpose because that would taste gross. I decided upon almond flour for the flavor and the texture. 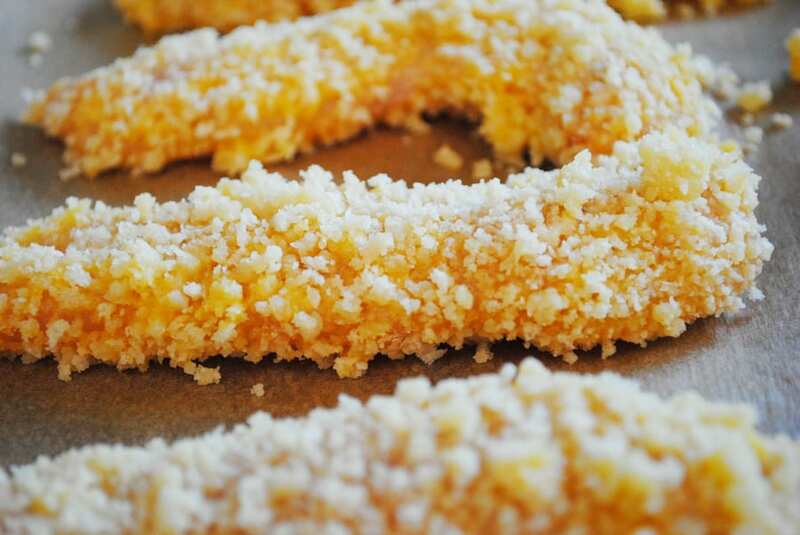 I didn’t want to totally give up on Panko either because of the awesome crunch it provides. So I combined the two and am super pleased with the results. If you’ve never used panko before, welcome to 2018. Haha! It’s a super crunchy Japanese breadcrumb and is usually found in a box on the Asian section at your supermarket. For almond flour I love to use Bob’s Red Mill. They sell it in huge bags at Sam’s Club even. But they have small bags in the health food section of the grocery store. Preheat an oven to 450 degrees. Or 425 degrees for a convection oven. Prep your coating station. 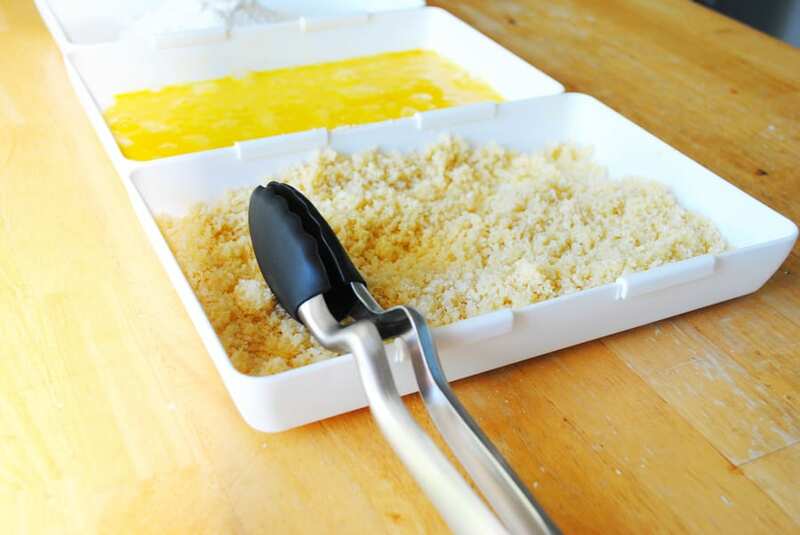 Use three shallow bowls, or breading trays, if you have them. In the first bowl put the all purpose flour. In the second bowl, whisk the three eggs. In the third bowl mix the panko and almond flour. Then pour in the melted butter and mix together using your fingers or a fork until it is all evenly incorporated. 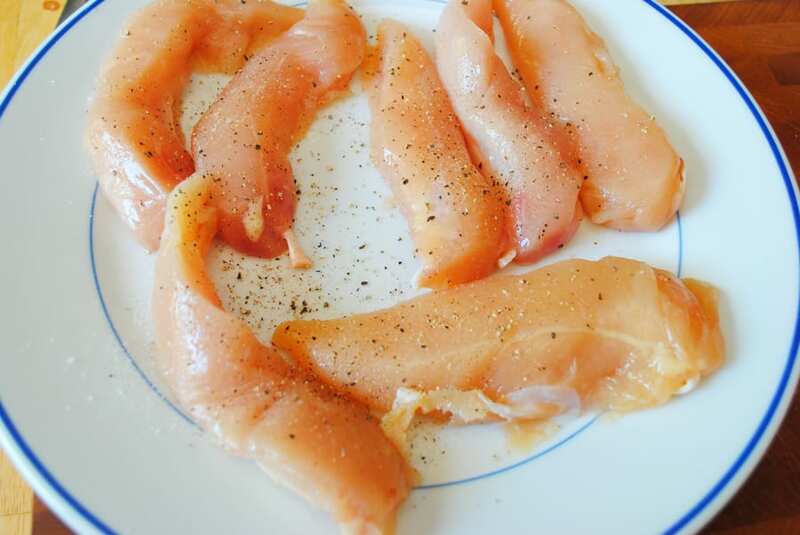 Sprinkle the chicken with kosher salt and black pepper. Working one at a time, put the chicken into the flour and coat on each side, then shake of excess. Place the chicken then in the egg mixture, coating it well, and then lastly into the panko/almond flour mixture. 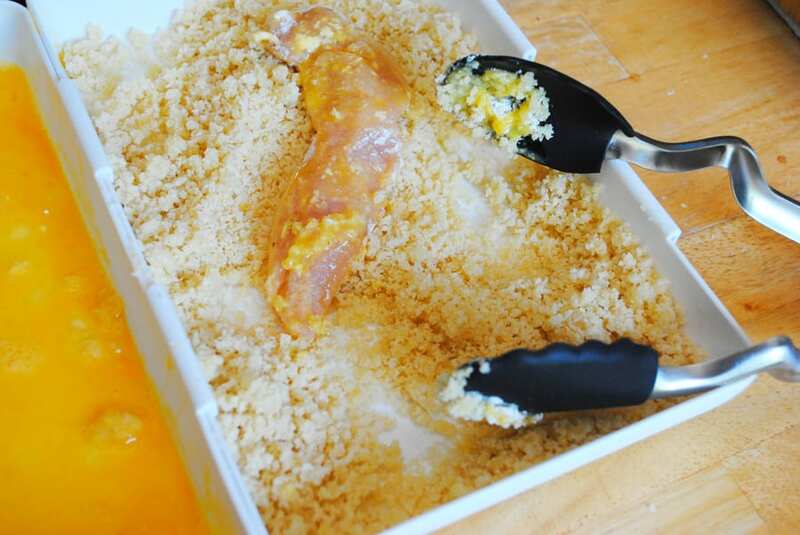 Make sure it is well coated and then place the chicken tender on a well greased sheet pan. Continue with each chicken strip until they are all on the sheet pan. Bake in the oven for 20 minutes (15 minutes for a convection oven), then turn on the broiler and cook for 5 additional minutes, turning after 2.5 minutes so that each tender evenly browns. 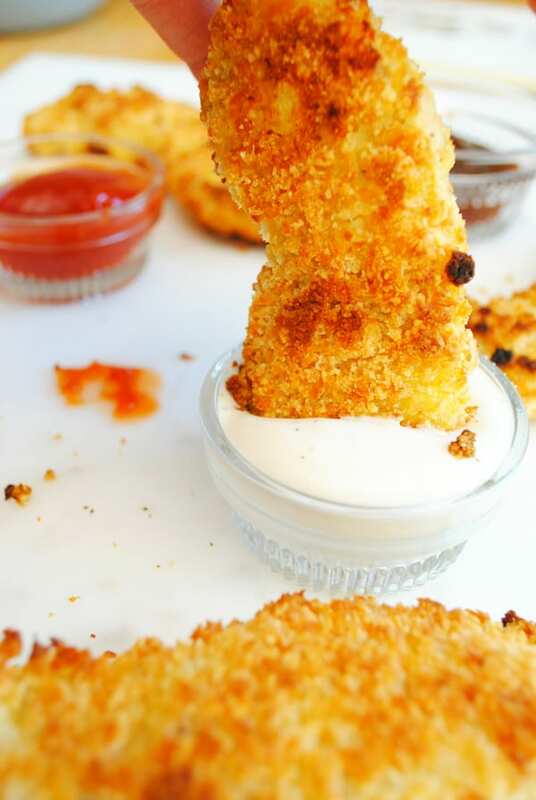 Let cool for 2-3 minutes and then serve with your favorite dipping sauce.